The focus has been to deliver something that is truly useful. We hope this version helps you make informed decisions about your solutions. And a big thank you to all of those who have helped me along the way, those being Beezwax team members and many loyal InspectorPro fans. Thank You! One thing that I have noticed with every new version of FileMaker is how the breadth of the platform continues to expand. New features and capabilities are born with every new release, and some of these new features require growth of new skills. At Beezwax, one of the ways we are trying to encourage this growth is to work on FileMaker development in teams, including pair programming, peer review, agile development and using collaborative tools. And because I see this trend only growing in the FileMaker world, I wanted to help support more collaboration by building in better support for InspectorPro analyses to be shared. With the previous version you could host InspectorPro on FileMaker Server so your analysis could be viewed by others. However, the parsing of data only happened locally, so the imports would run over the network, via a FileMaker Pro Advanced client — much slower than running the analysis locally. Now, when it is hosted, InspectorPro offloads all the processing to the server, leveraging the power of FileMaker to efficiently support project teams. InspectorPro helps you focus on one of the most commonly asked questions, as a developer: Where is this item referenced? Note that you can link to any item in this list and InspectorPro will also show you when a reference is dormant as well, allowing you to see at a glance what code could also be removed. Which types of layout references am I using? Am I using Go To Layout by name or by calculation? How many of those references are there, and where are they? InspectorPro gives you very detailed answers about these questions. And just like references, these are also links where you can click to navigate and see exactly where an item is referenced. We are always looking for ways to improve performance with FileMaker solutions. With InspectorPro 6 we went to extreme lengths to improve processing and importing. A number of changes we made under the hood make a dramatic difference in performance. Not to mention that we are always adding more XSL files that we parse for every FileMaker Database Design Report (DDR), after it is exported from FileMaker Pro Advanced as XML. InspectorPro 6 parses more information than ever from your FileMaker solution’s DDR. The chart below illustrates our progress in this area, comparing InspectorPro versions 3.x through 6.x. 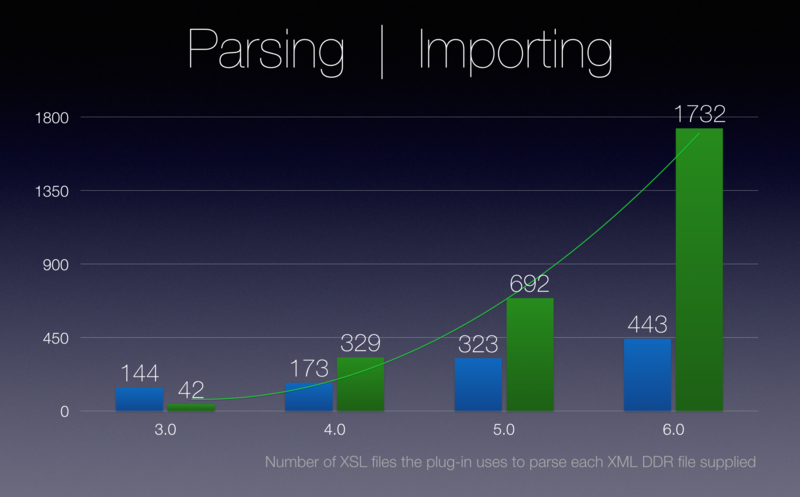 The blue bars represent the number of XSL files and the green bars represent the number of records per second that InspectorPro imports ( into the dependency table ). In this latest version we are at a whopping 443 XSL files. Why so many files? That is because we normalize and aggregate all kinds of metadata so that it is ready and available to you when you need it. The other major performance improvement is that with InspectorPro 6 you can have the FileMaker Server do all the work. If you have been in the habit of analyzing large DDRs on your computer you’ll really come to appreciate the work we have done in this area. If you compare running a large DDR through v5.5 vs v6.0, you should see up to a 75 % increase in performance. The goal with InspectorPro 6 was to have the solution be aware, and take advantage of, when it is hosted on FileMaker Server vs. running locally. Now, when it is hosted, InspectorPro offloads all the processing to the server. So, the only delay you see is the time it takes for the DDR files to be moved to the server. With FileMaker 13 we were introduced to PSoS (Perform Script on Server) which it is still one of my favorite modern features of the FileMaker Platform. As one of the first to take advantage of this for FileMaker solution analysis, we coined a new term for this: PDoS (Process DDR on Server). It’s awesome and addictive. When InspectorPro is hosted a pulsating indicator will animate in the top right of the InspectorPro window showing you that FileMaker Server is working on an analysis. However, this doesn’t prevent you for exploring other analyses that have already been processed. If you send up multiple DDRs to the server, because the InspectorPro plugin is 64-bit and fully threaded, it is theoretically capable of maxing out your FileMaker Server when parsing DDRs. Fortunately, we set up InspectorPro 6 to only queue up DDRs and process them one after the other (and not on your machine). There are a few settings youll have to turn on with FileMaker Server to allow InspectorPro to Process DDR on Server. These are mentioned in the Quick Start Guide. Otherwise it is drop dead simple: Register InspectorPro, upload it to your server and empower your team to work together. Often times just before I head home I’ll throw a few DDRs up to the hosted version of InspectorPro. Running PDoS not only has the advantage of the server doing all the processing, but it offers other side advantages. It offers your project team the ability to be in sync with the solution. In InspectorPro 6, We added a way to attach notes to any item and have the notes persist from one analysis to the next. This is another example of the benefits and highlights of the collaborative features of InspectorPro, and of using FileMaker to architect it. We are open to other suggestions and ideas that you might have in regards to using InspectorPro for collaborative development. For any identified problem, enter a comment and/or mark the item as “fixed”. We also made some awesome changes and improvements to Comparisons as well. InspectorPro 6 will now generate MD5 hashes all the way up the hierarchy. So, when you select an analysis and compare it with a prior analysis you’ll be able to instantly see where things have changed. No additional processing is required because the hashes are stored values. This means your dashboard instantly reveals where the changes have occurred. 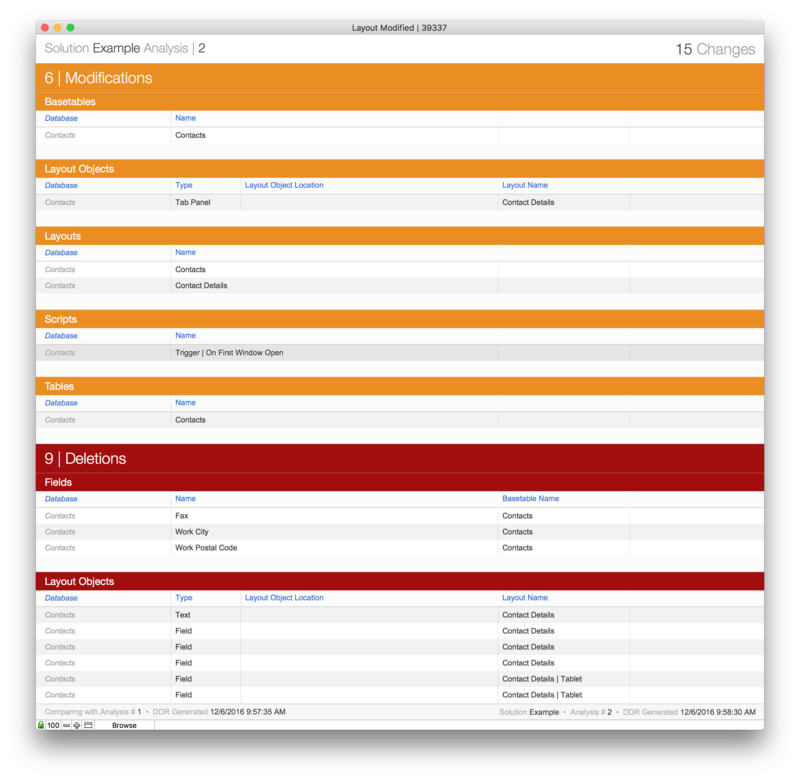 InspectorPro 6 can also generate a comprehensive report of changes. For items that have been added or modified, you’ll be able to click on them to navigate to them. Detailed Comparisons: What’s added, modified, changed? 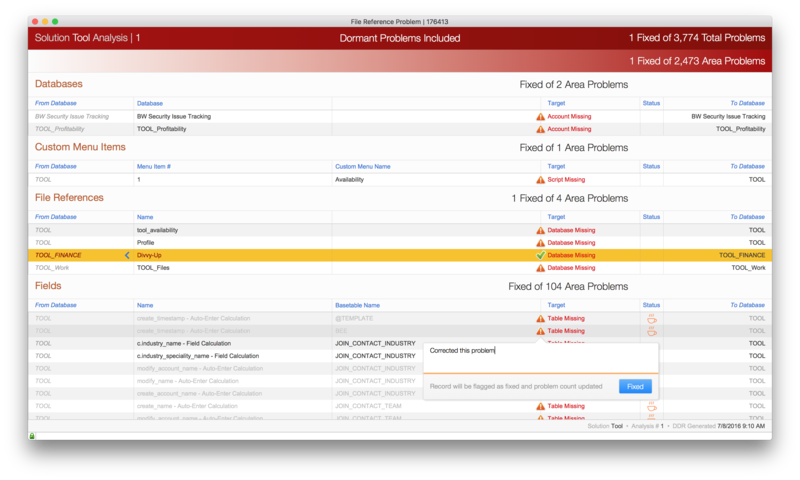 When it comes to identifying problems in your FileMaker solutions, InspectorPro has you covered. You can choose to detect problems only where code is active, or have it show you where problems exist anywhere. This is fast and accurate, and like the other areas of InspectorPro 6, you can click to navigate and view more details about an item that has problems. We also take collaboration one step further here with solving problems. Click on a warning triangle and you’ll get a popover that will allow you to enter a comment and/or mark the item as “fixed”. InspectorPro has come a long way and continues to improve. We hope it assists you in your FileMaker development by providing insight, fostering collaboration and helping you create great solutions. To order InspectorPro 6 or an upgrade from previous version, check out the InspectorPro product page. Please send us questions or feedback to inspectorsupport [at] beezwax.net — we love to hear from our customers and fellow FileMaker developers!